Android Kitkat was released last year by tech giants Google. While Google devices got the update immediately, various older smartphones havent received the update yet. 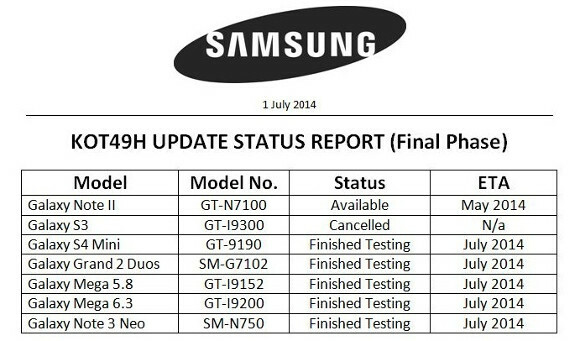 A Samsung document has been leaked showing the KitKat release schedule for 5 Samsung devices the Samsung Galaxy Note 3 Neo. This document has been leaked from Samsung India but comes from a reliable source inside Samsung. The list of device includes the best selling Note, Galaxy Note 2 (for which update is available) and the first in line of Mini phones, Samsung Galaxy S4 Mini. This month will see updates rolling out to Samsung Galaxy Note 3 Neo, both Galaxy Megas and Grand Duos. as well. Samsung Galaxy S3 (International version) will not get a Kitkat Update. This fact was confirmed by Samsung few months back and reinforced here. If you device is in this list, Hold on to it. KitKat Update is Coming!